That was the prayer recited by the Rev. 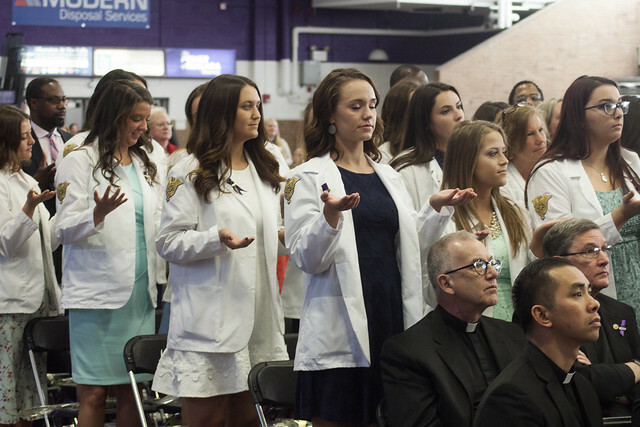 Vincent O’Malley, C.M., as 111 newly graduated nurses held their hands in front of them, a symbolic welcoming into the nursing profession. This year’s ceremony took place Friday, May 11, in Niagara’s Gallagher Center. Following a reflection by Father O’Malley (Read Father O'Malley's full speech), the graduates were presented with pins signifying academic achievement, scholarly learning, professional dedication and Christian commitment. The pins, received by graduates to acknowledge entry into the nursing profession, are unique to Niagara University’s nursing tradition. Niagara University’s School of Nursing is accredited by the New York State Department of Education and the Commission on Collegiate Nursing Education (CCNE). The School of Nursing offers three different degree programs: bachelor of science (B.S.) in nursing (four-year degree), RN-to-B.S. completion program (post-associate degree), and an accelerated B.S. in nursing (one-year post-baccalaureate degree). For more information on Niagara University’s nursing programs, please visit www.niagara.edu/nursing.